Price: $12 for 9 oz. Ingredients: Purified Water, Aloe Barbadensis Leaf Extract, Marshmallow Root Extract, Rice Bran Oil, Avocado Oil, Behentrimonium Methosulfate and Cetearyl Alcohol, Stearalkonium Chloride, Yucca Root Extract, Cetrimonium Chloride, Vegetable Glycerin, Blueberry Seed Oil, Panthenol Vitamin B5, Fragrance, Germall Plus, Lactic Acid. Consistency: Light, thin, almost serum-like. If I told you the first analogy that popped into my head, you would think I was being inappropriate. 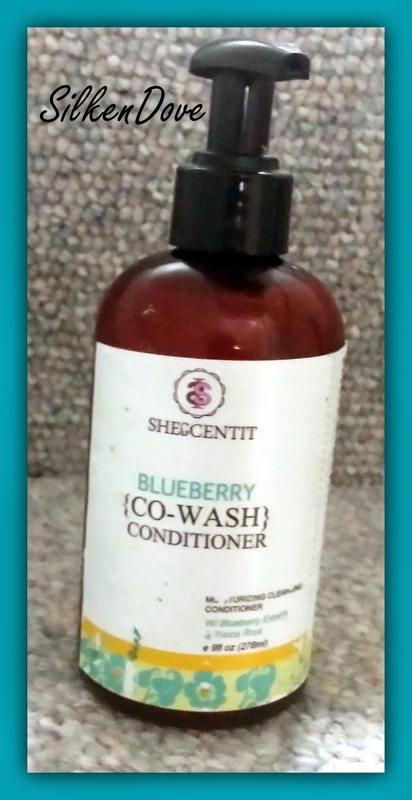 Results: This is one of my two favorites from the She Scent It line. I was skeptical at first about whether the yucca root would be able to clean my hair, but it really does! I have been using this product as my cleanser almost exclusively for about a month and a half, and I have not experienced any buildup. Also, a little goes a long way. I still have about a third of the bottle left. It also helps me detangle before I even put in my rinse out. Can you tell I'm a fan? Love it, Like it or Leave It: Love it. I just discovered your blog & love your reviews - they are short/sweet & to the point. Had to pop in and say thanks for your great review! I grabbed this on a whim thanks to your review and just used it recently for a wash day. I'm so in love with it! It really did cleanse my hair (I actually saw "dirt" coming out as I rinsed). Detangling was a breeze, my hair was super soft after rinsing. I almost didn't want to deep condition afterwards! This is officically my favorite cleansing conditioner. I have a bottle of another brand of cleansing conditioner to use up but after that I have no plans to buy another unless SSI messes with the formula. Happy I could help! This is one of my two favorite co-washes now.